In today’s ‘Culture of Death/Murder’ in Canada we are faced with another great threat to human life, this time it is aimed at the end of the human lifespan. Quebec has recently passed Bill-52 (http://www.lifecanada.org/quehttp://www.prophecynewswatch.com/2014/) (http://www.prophecynewswatch.com/2014/June11/115.html ) making euthanasia legal. The rest of Canada is in grave danger of having many of its elderly citizens euthanized, killed, for a more explicit word. Let me be very quick to say that the only ‘good death’ is the one in which the dying person dies on ‘God’s appointed time’ , what is known as a ‘natural death’ and has the ‘time’ to prepare oneself spiritually to meet God by ‘having one’s full consciousness’ and ability to communicate with God and with others. Death by euthanasia is done through the doctor’s ‘self-appointed role of God’ who decides ‘when’ that person will die, often in a coma, quickly, and without the time and the means to prepare oneself to meet God. God have mercy on that doctor. According to Webster’s Dictionary ‘euthanasia’ means “The act or method of causing death painlessly, so as to end suffering; advocated by some as a way to deal with persons dying of incurable, painful diseases.” Euthanasia may be divided into two categories: active euthanasia and passive euthanasia. Passive euthanasia is a planned and premeditated practice of ending a sick person’s life by intentionally not providing nutrients and liquid. (CF: http://www.geocities.ws/euthanasia_ark/ ) This is an excellent link for Paul Wong’s explanation of Passive Euthanasia, I strongly urge you to read it. By reading it you will have a much better understanding of my mother’s death during ‘palliative care’. You will see that not all medical personnel and not all nursing homes are pro-life. I have the personal experience of this heartbreaking and agonizing reality. I fought the hardest battle I’ve ever known in my life in a nursing home for nine years, to keep Mom alive and of a sound mind. You see, Mom’s doctor wanted to terminate her life, put an end to it. Instead of naming it euthanasia she called it ‘palliative care’. Mom will die in ‘God’s’ time, not in ‘your’ time. Mom lived for 91 1/2 years. She rejoiced in and appreciated every additional moment of LIFE as a gift from God, her Creator. Mom and I had a clear understanding with each other regarding her pain control. If she had too much pain she would request a pain-killer as a last resort. Mom also wanted me to protect her from any unnecessary drugs so that she could retain her reasoning and communicative and praying capabilities. This was of utmost importance to her. I deeply respected and defended her wishes and I was even taken to court over this. I was threatened by several doctors that if I did not consent for them to give Mom anti-psychotics they would take me to court. I was taken to court by Mom’s doctor. The Court’s Judgment gave her doctor the right to give Mom up to 50 mgm of anti-psychotics however any *additional amount of the drug had to have my approval. In the last few months of her life (May/June of 2011) Mom was put on Palliative Care. After they entered Mom’s room, the first thing the Administrator said to me as she was trying to hand me a ‘No Trespass Notice’ was: “You are no longer allowed on the premises or I will call the police.” What follows is a resume of “Trespassing Notice”. I also received a copy of the same by registered mail on April 26, 2011. It has come to my attention that you have been verbally abusing and intimidating the staff over the care of your mother. This is not the first time that this issue has arisen and because of your mistrust and harassment of the staff this letter will serve as written notice that you are no longer allowed on the Nursing Home property. My staff have been informed that police shall be called if you trespass on such property. Thank you for your co-operation. Nursing Home Administrator. Cc: Police Chief and Deputy Police Chief. I told her and the Nursing Director I could not believe what I am hearing: “Here is my mother who is living her last days, weighing about 80 lbs, her appetite suddenly cut drastically, and I who is her son, and her caregiver and Power of Attorney for so many years is being told in no uncertain terms to immediately leave the premises of the Nursing Home or the police will be called. I am threatened to be unable to be by her side any longer, perhaps even in the days prior to the moment of her death. All this on the basis of false charges of harassment and verbal abuse and mistrust of the staff.” I also told her: “You call the police and I’ll make sure this all goes public!” Her charge of ‘mistrust’ is correct and I have great reasons from past experience with the Nursing Home to be so. As far as the charges of verbal abuse and harassment go, I totally deny them. Anyone who checks out my character in our community ( in which I have lived for 37 years) will discover the contrary to the administrator’s false accusations. I have been in Insurance Sales and Real Estate sales most of my life. I have also been very involved at the religious level and never have I had any such accusations made against me. The problem lies with the administrator. She has had a total disrespect for me and many others ever since I took over as Power of Attorney (P.O.A) for my mother at the Nursing Home. My warning to the administrator about going ‘public’ about my eviction from the Nursing Home got her to cool down her temper and reconsider. Then she said to me: “Maybe we can make a compromise.” I said thinking to myself “I have no choice but to accept her compromise, if I want to be with Mom in her last days.” This is the verbal compromise I had no choice but to accept under the circumstances: NOTE: the administrator’s intention with this compromise was to ensure I would not go near the Nursing Station to see Mom’s files. You are not to go near the nursing station, nor talk to the staff, just say hi when they come to give your mom her meds and that’s it. To go directly to Mrs. Deschenes room. To ring when ready to feed his mother and staff to bring the tray to bedside. He is not to interact with staff other than to exchange pleasantries. Any inquiries regarding his mother’s status must be directed to the NCC. If Mr Bruneau insists on giving orders, goes anywhere other than his mother’s room (ex. Dining room, nursing station, medication cart) staff must call police. Attached to this memo is a trespassing notice which is to be shown to the police when they arrive. Staff are to follow this directive implicitly. Administrator. HOW DOES THIS “COMPROMISE” AFFECT MY MOTHER AND MYSELF? I am prevented from communicating freely with those who have the care of my mom. I am also not permitted access to vital and pertinent information in the here and now, today by going to the R.P.N and asking to see Mom’s records. Certain problems have to be dealt with now, not later, not hours later or tomorrow by contacting the Nursing Coordinator, only, and if she is available. This muzzling of me and my ‘isolation’ from the staff by the administrator is a great hindrance to my rights as P.O.A to have immediate access to information concerning my mother and this imperils mom’s health and her safety! These visiting restrictions fly in the face of my “rights” as Power of Attorney. I am kept in the dark, kept to Mom’s room. Is this the way to treat an adult, someone who has no criminal record, has a very good reputation and who has one purpose only in being there—to see that his mother’s rights are respected and that she gets the best of care. All of this abuse towards me happens at the most important, most sensitive time in my mother’s life and my life as her caregiver. I already have the burden of knowing that I may soon lose Mom and now I also have this assault on my liberty, the violation of my rights as mom’s P.O.A and the defamation of my character by the administrator as an added burden. Since then I have had great difficulty sleeping at night and this is affecting my health and the care I give Mom. How insensitive can an administrator be towards a caregiver whose mother’s health (age 91) is most fragile and who may soon be dead? This is not the first conflict I have had with the nursing home administrator. It has been ongoing for nine years. And my modus operandi has always been the same. Trying to get the proper facts about my mother, making sure on a daily basis , in the here and now, that she is getting good care etc. But every time I have a justified complaint about mom’s care, it goes to the administrator’s ears before I even have time to discuss it with anyone looking after mom’s care. They have an excellent communication and spy system. The administrator calls a meeting, not to hear me out but to treat me as an enemy and find something to falsely accuse me with. There is an organized effort spearheaded by the administrator to keep me from seeing “ALL” of my mom’s records. I will explain why this is so with a few of my many lived experiences at the Nursing Home. Back in 2007 for several days my mother was very heavily sedated. Finally on a Saturday morning I told the R.N on duty: “I want to see ‘ALL’ of Mom’s records. She cooperated well with this and I found out why mom was so heavily sedated. You see at that time I had given the okay to mom’s doctor to increase the dosage of anti-psychotics by 25 mgm WITHOUT KNOWING that the doctor WITHOUT my knowledge or consent had also increased the dosage by 25 mgm for a total of 50 mgm of seroquel antipsychotic! It is no wonder Mom was out of it! The only reason I saw the PROOF of this with my own eyes is because the R.N was sympathetic to me and showed me EVERYTHING! She is my witness to this. The R.N showed me other files about Mom that were kept BEHIND the nursing station of which I was not aware of. To add insult to injury, before I saw this proof I had gone to the nursing station and asked the R.P.N on duty if mom was getting any other meds over and above her regular meds known to me. She replied: “No.” She had lied right to my face. There are other occurrences like this one that I have discovered and had been ‘lied’ to. She lost any respect from me after that. I can no longer trust her word any more. And now the Nursing Home administrator accuses me of distrust?!! And the staff gets upset at me when I ask questions or make comments about my concerns for my mother’s health care. I am the one who has many reasons to be upset and to distrust after all the lies and hypocrisy my mother and I have had to deal with in my searches for the truth about her meds, etc. Can you understand now why the administrator has and wants such a tight control on what I see and can’t see as far as information concerning my mother goes?! The protocol which they have often asked me to follow when I request any information is as follows. They want me to address myself to one of the administration staff to schedule a time in the future to sit down with someone of the nursing staff and look at mom’s records. I have consented only once to this protocol because within myself I knew that it was their way of controlling what I see and what I don’t see. It gives them “Time” to prepare things, to work against my access to ‘all’ the information. I have always told them at the nursing station that it is my right to access mom’s medical records NOW. They like to keep repeating: “You get copies of your mom’s records every month.” That’s right I get them two weeks after the last month has gone by. Much water has gone under the bridge since then. It is in the present moment when a problem occurs involving mom’s health that I need to KNOW so I can , along with the staff , ‘nip the problem in the bud’. Another example of the importance of me knowing NOW that a problem arises is when mom was given her bath in the “afternoon”. She was very upset and fought them and told me so. What you must know is that for the longest time mom has only been given her bath in the EVENING after she had her antipsychotics to calm her down. This problem led to the R.N and I looking at mom’s Care Plan, because the Personal Support Worker who came to apologize to me had informed me that she was only following the directives of the Care Plan which had not been updated in eight months! The R.N told me that everyone’s Care Plan is supposed to be updated every three months. This again showed the ‘incompetence’ of the Nursing Home staff in failing to update mom’s Care Plan. Another grave error occurred when mom was given a ‘flu shot’ (see Diary, Nov 3, 2007) when in fact I had given the Nursing Home written instructions not to give the flu shot to mom. My belief, based on a well known international authority in the field, is that flu shots are very detrimental to one’s health. It is known to have caused blindness, chronic fatigue, total disability and even death, to name just a few. I have personally met with local people whose health has been greatly impaired immediately after getting their flu shot. So you can see by now that the administrator is tremendously concerned about what information is made available to me. I have the proof of lived experience of nine years at the nursing home. I have seen and learned many things about the ‘modus operandi’ of the administrator and its staff. The administrator’s goal, which is pursued with great zeal, is to keep the residents and their P.O.A’s in the DARK as much as possible. One nursing home resident, whom I’ve known for several years, a highly educated, professional individual, replied to me when I told him that I was having great difficulty in getting my wishes for mom’s care: “Here, it is a one-way street.” (Diary, July 12, 2006) It is mistakes like this that the administrator works so hard at keeping caregivers from knowing about so as to prevent possible lawsuits. These kinds of ‘professional errors’ which I discover more and more is the reason the administrator and staff have always done their utmost to prevent me from having access to information about mom. When I was new at my duties of P.O.A , I did not know my rights and they took advantage of this fact. When I asked for information they would tell me: “We can’t show you that information”. Once I discovered my legal rights I went to see the administrator on July 26, 2006, showed her the written laws granting me access to medical information of my mother and said to her: “I want a copy of every single piece of mom’s files for June and July of 2006 before Friday. Do I have to use ‘legal’ means? !” The administrator knew that I now knew my rights and knew that I meant business. The next day she hand delivered me copies of mom’s files. Note: This is all recorded in my diary as is everything else I say. As I near the end, I wish to explain something very important about my ‘behavior’ in relation to the accusations against me. Always, when I ask for information concerning my mother’s care or make comments or complaints to the P.S.W’s or the nursing staff I am accused of verbal abuse, harassment or intimidation. Let me be clear, I have never used abusive language with anyone. I respect people. This is part of my Christian beliefs. I speak out loud often, out of habit because I have been born with nerve deafness. My hands are in motion when I speak -what can I say, I am French Canadian. When I am dealing with serious matters that concern my precious mother, yes, my facial features are very serious, the tone of my voice is serious, because the subject matter is very serious. The major reason I am not liked at the nursing home, is that I , unlike many other P.O.A’s , know my rights, and I am a person who stands up to any type of injustice, especially so when it involves my mother. Thus after nine years of struggle between the nursing home and myself the administrator did what no reasonable , caring administrator would ever do. She fully intended to put me out of the nursing home once and for all, using accusations such as verbal abuse, intimidation and harassment. And what was the trigger for this cruel action of hers? It was my demand to see my mom’s medical files, my right under the law. Again, is there something very important they are trying to hide and they don’t want me to know? Is it a repeat of what happened when my mother was being given extra anti-psychotics and anti-depressants behind my back? Based on past experiences at the nursing home I strongly suspect that mom’s drastic decline in her appetite and nausea was caused by some drug she was getting. I could say so much more, my diaries are full of information, but I think you have a good idea by now as to why I and , as a consequence , my mother has been so unfairly treated by the administrator. You can also understand why the administrator wants me out of the nursing home.. I wonder how many other people like me she has treated so unfairly? An investigation would reveal so much. Meanwhile I as write this (April 30th, 2011) , it is my poor, precious mother who is starving and suffering, and who would suffer a lot less if I had access to all of the information about her. I might just find the cause of her nausea which has not relented since April 17th. She is getting weaker and weaker , by the day, by the hour. END OF ARTICLE. NOTE: this portion of write-up was written before Mom died. Mom has been nauseated and not eating, and drinking very little for 17 days now (Since April 17th) and NO ONE here did anything about it, including you! Mom’s doctor quickly understood the point I was making of the grave irresponsibility and negligence of the Nursing Home Staff and herself in doing nothing about Mom’s nausea for 17 days in spite of my repeated complaints. On May 16th when my brother visited Mom and my wife and sister-in-law was present, the Nurse Practitioner suddenly came and said that Mom’s doctor is coming shortly, she wants to have a ‘family meeting.” This meeting was to discuss ‘Palliative Care’. This was a total surprise to me, totally unexpected. Mom’s doctor came, assisted by one of the nursing staff. I understood ‘Palliative Care’ to mean giving Mom ‘Morphine’ only as required, to control her pain, not to hasten her death, which was her doctor’s intent. Palliative care is an approach to care for people who are living with a life-threatening illness, no matter how old they are. (*NOTE: Mom did not have a life-threatening illness!) The focus of care is on achieving comfort and ensuring respect for the person nearing death and maximizing quality of life for the patient and family and loved ones. (*NOTE: I was not comforted, I was abused constantly by the Nursing Home staff and her Doctor while Mom was on Palliative Care.) Patients in Palliative Care get full support if they wish to pursue any and all efforts to cure their disease. (*NOTE: Mom had constant nausea and the Nursing Home and Mom’s doctor did nothing to stop the nausea except order blood tests AFTER 17 days of doing NOTHING about Mom’s nausea, and only after I complained face to face with Mom’s doctor.) (CF: Health Canada: Palliative and End-of-Life-Care.) As Power of Attorney, I consented to having Mom on ‘Palliative Care’ to control her pain., on condition she receives the ‘minimal dose’ of morphine. (Mom’s doctor suggested starting at .5 to 2 mg of morphine.) and on condition that each morning the R.N would give me a copy of the Nursing Notes for the preceding 24 hour period. Remember, I was unjustly isolated to Mom’s room and had great difficulty having access to her medical records. On Wednesday, May 18th, Mom’s doctor stopped all Mom’s medications, without discussion of this at the ‘family meeting’ when we discussed the issues of palliative care. I know today, after Mom’s decease, that “Removing the medications used to treat chronically-ill patients precipitates an intentional acute crisis from which they are not allowed to recover. Patients with heart or blood pressure conditions no longer are given their medications and they die shortly thereafter.” (Stealth Euthanasia: Health Care Tyranny in America) ( http://www.hospicepatients.org/this-thing-called-hospice.html ) I wish I knew then what I know now about the removal of all medications. May 18th and 19th Mom drank only a few sips of water. She was dehydrating…it was very obvious to me. On May 19th when I asked the R.N why staff were not giving Mom water during the night she replied: “That will only prolong her. “ They were making no efforts to keep Mom alive. May 19th, I walked home, crying all the way, realizing Mom would die within a few days, at most a week, unless I had her hydrated. So on Friday May 20th after calling Alex Schadenburg, founder of the Euthanasia Prevention Coalition to discuss Mom’s plight and fully aware of the serious effects on her dying without food and water, I drafted a letter to Mom’s doctor, insisting that Mom be hydrated by ‘subcutaneous infusion’ (also called hypodermoclysis : ( http://www.aafp.org/afp/2001/1101/p1575-s1.html ) at the Nursing Home starting today, and if not possible, I want her transferred to the hospital for this. At 3:30 p.m when I presented the letter to Mom’s doctor in Mom’s room she was furious. Her facial features said it all. Instantly, she replied to me: “I will not do it, because it goes against my training as a doctor and against my personal beliefs!” She had no sooner said this that she said: “An R.N will be here shortly to arrange for the subcutaneous infusion of your mother.” I was stunned to see such a sudden ‘change’ in the doctor’s firm decision. Why did she consent? In hindsight I reasoned that it was because if she refused my request, then Mom would have been transferred to the hospital, many tests would have been done by ‘other doctors’ and they may have found the cause of Mom’s nausea. By keeping Mom at the Nursing Home, her doctor kept ‘control’ of her ‘agenda’, to euthanize Mom. So Mom was put on ‘subcutaneous infusion’ beginning May 20th. She was on 3.3 dextrose, 1200 mls/24 hours , the equivalent of 4 to 5 glasses of liquids per 24 hours. When I told Mom we were installing an I.V. for her to have liquids she said: “I’m so happy to know this.” After the doctor left the room I spoke with Mom and she said: “I don’t want to go now, I want to live!” On May 16th during our family meeting with Mom’s doctor, she made it very clear to us—because I was suspecting she was giving Mom pills unknown to me—that Mom was not getting ‘extra pills’. As I said earlier, Mom’s doctor stopped all Mom’s medications on May 18th, however on May 22nd Mom said to me at 5:45 p.m.: “They gave me some pills.” I looked into the wastebasket and discovered a plastic, one ounce pill container and plastic spoon both covered with a leftover of crushed pills with a yellow colored paste. To this day I strongly suspect it is the cause of Mom’s nausea. On Tuesday, May 24th, the attending R.N said to me: “Did you know hydration is done normally for only 48 hours and then removed.” I replied: “My Mom will have hydration till she dies!” This again shows the Nursing Staff working hand in hand with Mom’s doctor to euthanize her. On May 26th, at 5 p.m. Mom said to me: “She’s got more pills to give me and they are full of muck (paste).” This was another sign of Mom being given crushed pills behind my back. Up until May 31st, Mom’s dose of morphine was below 2 mg/dose. Then ‘suddenly’ on June 1st, without any warning and without my permission it is increased to the level of 2 to 4 mg/dose. I was not consulted and was against this, and I told the R.N. who said to me: “I am surprised that you were not consulted and that the R.N did it.” I asked that R.N. that the order be reversed and for the dose to remain between 1-2 mg/dose of morphine for now. June 10th, 4: p.m. Mom’s doctor came and said: “Your Mom has too much water in her legs.” She strongly suggested to not give fluids to Mom for a few days. I reluctantly agreed to stop the liquid intake for Mom from now (4 p.m.) till noon the next day, which was a total of 20 hours. However, in hindsight, I did not feel at peace about this decision. At 4:30 p.m, the R.N quickly came in without a word to me and removed the butterfly intake from Mom’s abdomen and suddenly, to my total surprise began to leave the room with the tripod holder for the liquid bag. I said: “Hey, where are you going with that?” She replied: “I’m bringing it to the office, will return it tomorrow.”I was stunned and asked myself—“Why are they removing the metal tripod bag holder. ?” It was a bad omen. To this day, I have had regrets to agreeing to stop the water intake into Mom for 20 hours. Was it this which triggered Mom’s coma, which began approximately 35 hours later? On June 11th, 7:45 a.m. Mom said to me: “I don’t want to die now!” Again she was expressing the desire to live and not to die! Mom’s desire to live was always so evident, right to the end of her life! Something very important to mention here, now is the fact that every day during Mom’s Palliative Care, when I would come in the morning, Mom’s mouth was dirty, was filled with a light brown coloured ‘paste’ between her teeth and her gums. During the day I would clean her mouth and teeth up well, only to have to do the same the next day. What meds were in that paste? An investigation would reveal it. I did not bring the matter up with the R.Ns for fear that they would twist this around as an excuse to evict me. This paste, used to give Mom crushed pills only confirms my belief that Mom was given a med or meds continually behind my back during her Palliative Care. Were they the drugs causing her nausea?? I would so much like to know! An investigation must be done. On June 11th at 7:20 a.m. Mom, who was fully conscious, gave me the most sincere and heartfelt ‘THANK YOU’ for all the years of care I gave her. That same day at 4:20 p.m. Mom said: “I will pray for you.”. Such words of comfort! However I did not know as I left her room that night that those words would be the last ones I will ever hear from her on this earth. On June 12th, at 3. a.m. my wife woke me up saying: “The Nursing Home just called, your Mom is in a coma.” Within 10 minutes we were at Mom’s bedside to spend the night in prayer with her, holding her hand, praying the Chaplet of Divine Mercy for her, speaking to her (people in a coma can still hear you) and reading her the Word of God. Mom peacefully and quietly left this world with my wife and I and part of her family at her side at 10:33 a.m. on Sunday, June 12th, Pentecost Sunday.. My battle for Mom against the Culture of Death/Murder had come to an end. In early June, 2011, one of the few sympathetic Christian R.Ns said to me at Mom’s bedside after I had shared with her my many struggles and battles against the Culture of Death/Murder here at the Nursing Home: “In life, eventually the TRUTH always comes to the surface.” I firmly believe this. I pray that my writing this testimony of my struggles against passive euthanasia will cause a ‘thorough investigation’ to be done one day surrounding my mother’s death, for Mom’s sake and the sake of all others whose lives are terminated earlier than Destiny would have it. Imagine what happens to so many other defenceless residents like Mom who have no P.O.A. like myself to defend them against the Culture of Death/Murder manifest through doctors like Mom’s doctor and staff, the likes of which I had to deal with? Mom said it so many times. It was crystal clear. She wanted to live, she did not want to die! Nausea was her problem, pain control was the temporary solution required, not euthanasia, not rushing, advancing her death. In this Culture of Death/Murder I have a most sobering message to give to all those people who are pro-euthanasia, pro-Culture of Death/Murder. In euthanasia, active or passive, man comes against God’s exclusive right over ‘life and death’. 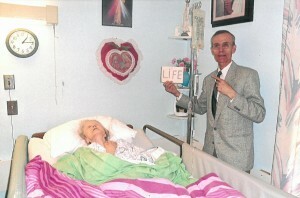 Euthanasia is pure and evil rebellion against the Creator, who is a God of LIFE. “Time is precious, It gives us time to love, Time to have God’s preciousness.” Leona Bruneau-Deschenes, Dec 26, 2005. The song : ‘The Value of a Soul’ by Rose Nadeau, is a call to ‘respect and love’ our elderly people. As you have seen from my testimony, my heartfelt plea for good communication and transparency between the Nursing Home staff and myself fell on deaf ears. They were even more diligent afterwards in their goal of keeping me from having access to the necessary information I needed to give Mom the proper care she needed, until her death. My Mom and I suffered abuse like I could never imagine, especially in the last two months of Mom’s life where I was isolated to Mom’s room and unable to have access to her medical information. From day to day I was living under the constant fear and threat of being barred from the Nursing Home, from my mother. It was a nightmare. How many more residents of this Nursing Home and others like it have suffered unnecessarily because of such an attitude? ( http://www.carp.ca/2014/07/15/advocacy-centre-elderlys-take-antipsychotic-use-ltc-homes/ ) Note: This link is an excellent site for news on Nursing Homes. HELP AVAILABLE: PLACES TO GO FOR HELP WHEN YOU LOVED ONE IS MISTREATED OR THREATENED TO BE EUTHANIZED.